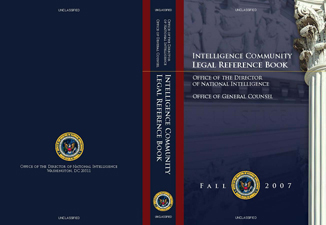 On behalf of the Director of National Intelligence, I am pleased to make available the Fall 2007 Intelligence Community Legal Reference Book. The Intelligence Community draws much of its authority and guidance from the body of law in this collection. As the Director of National Intelligence seeks to better integrate the Intelligence Community, we hope this proves to be a useful resource to intelligence professionals across the Community. This document is the result of many hours of hard work. I would like to extend my thanks to those across the Community who assisted the Office of General Counsel in recommending and preparing the authorities contained herein. I hope you find this book a valuable addition to your library and a useful tool as you carry out your vital mission.